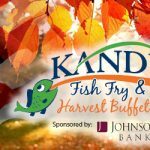 KANDU Industries Inc.Fish Fry & Harvest Buffet - KANDU Industries Inc.
KANDU recently held two successful Fish Fry and Harvest Buffet events at The Armory. Both October and November events featured beer-battered and baked cod, along with an array of additional seasonal entrees and sides. In honor of Veteran’s Day, all who have served in the U.S. military received complimentary meals during the November 10th event. Guests enjoyed two big screen showings of the 2016 VetsRoll mini-documentary by Drywater Productions, featuring footage and interviews from the WWII and Korean War honor trip to Washington D.C. We were honored to serve over 40 veterans and active duty military personnel throughout the evening. There were also 50/50 and item raffles available during both events. A special thank you to all of our sponsors for both events, with table sponsorships from the second event paying for free veteran meals.